Update: Whelp, if you didn’t think we were in for a phone reveal on May 30, think again. 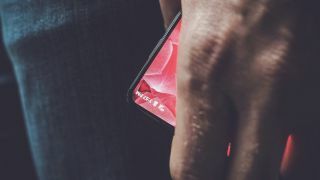 Android co-founder Andy Rubin’s start-up Essential sent out another tweet on May 25, this time of a rectangular silhouette that looks suspiciously like a phone (the buttons!). True to rumors, it appears there’s a hardware attachment, likely for the camera, on the top. Two months after teasing a mysterious new handset, high-profile startup Essential could be just days away from unveiling its debut phone. Started by Android co-founder Andy Rubin, Essential has let loose the first tweet on its official Twitter profile, announcing that “something big” is expected to go down this coming Tuesday, May 30. It was reported back in January that Rubin was designing a new, high-end smartphone that featured a ceramic back and edge-to-edge display. One standout feature of the rumored device is the ability to tack on new hardware via the phone’s charge port, not unlike Motorola’s clip-on Moto Mod upgrades. Since then, Rubin teased an image of what appears to be a bezel-less handset, while Alphabet executive chairman Eric Schmidt confirmed the phone Rubin’s team is cooking up runs on Android. This gives us at least two possible details about the mysterious Essential Phone, though we’ll look to learn more hard details when Essential drops its “big” news next week. The Google Pixel is an excellent flagship phone that’s only let down by mediocre battery life and the still-developing Assistant. If you can stomach the price point, the Pixel is a breath of fresh Google air in a world of Android over-complication.